Muscatine is home to an abundance of recreational facilities that are perfect for individuals and families alike. From the riverfront bike path to wooded trails, Muscatine County has a variety of ways to enjoy recreation in the area. Families with young children will find Muscatine’s Weed Park the perfect place to spend the day. The park’s amenities include a state-of the-art playground, an amazing public Aquatic Center complete with giant water slides, and several picnic shelters with nearby grills perfect for family cookouts. Visit Weed Park’s lagoon to feed the ducks or stroll through the spectacular rose garden, the memories you make spending a day in the park will last a lifetime! Riverside Park, Muscatine’s river front, offers family fun activities, too, with a river view! Children will love getting wet while playing in the interactive splash pad. Others may enjoy shooting hoops on the basketball court. Riverside Park is a natural place to access Muscatine’s Running River Bike & Pedestrian Trail System which links many of our community’s parks together. For boaters and anglers, river access is easily gained from the boat launch at the east end of the park where there is plenty of room for parking vehicles and trailers. In the evening, it’s the best place to view Muscatine’s colorfully lighted bridge. Saulsbury Bridge Recreation Area, which covers 675 acres along the Cedar River, is a fabulous location to enjoy the great outdoors. Maintained by the Muscatine County Conservation Board, Saulsbury offers hiking and equestrian trails, boat ramps, picnic shelters and public campgrounds. Outdoor enthusiasts will want to try their luck locating the perfect fishing spot or hunting in the timber bottoms. Discovery Park is Muscatine County’s newest recreation area and has fast become a favorite of residents. The park is home to the Environmental Learning Center, the Muscatine Arboretum, and a beautiful pond encompassed by hard surface trail affording access to everyone. The Environmental Learning Center is a great place for family fun, there is so much to see and do! The facility’s hands-on exhibits feature the types of animals and fish commonly found in the Upper Mississippi River Valley. Wildcat Den State Park is home to the historic Pine Creek Grist Mill, the pioneer-era Melpine School, and a trail system that winds past unique sandstone structures like Steamboat Rock and the Devil’s Punch Bowl. Wildcat Den also offers picnic areas and non-electrical campsites. Several public campgrounds and recreation areas are located east of Muscatine, along Highway 22. These Class A facilities are operated by the US Army Corps of Engineers and the Iowa Department of Natural Resources. Clark’s Ferry Recreation Area, Fairport Recreation Area and Shady Creek Recreation Area all are situated along the Mississippi River and offer campers modern amenities like 50-amp electric services, fresh drinking water, shower houses, dump stations and boat ramps. Whether you are a Muscatine native and are looking for something to do on a Saturday afternoon, or you are visiting Muscatine for the first time, the recreation areas offer never-ending excitement. 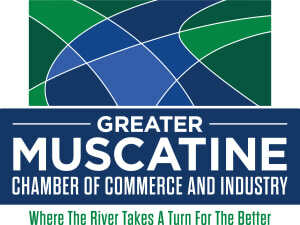 GMCCI is proud to promote the sense of community that is built through recreation here in Muscatine.